I’m trying to learn to love tofu. People tell me all the time that it doesn’t have any taste, that it absorbs the flavor of whatever you put on it. But I think it does have a taste, and it’s sort of weedy-beany. I also am turned off by the spongy texture and the way it sort of shreds. I’m attempting to embrace the curd as part of a plan to work more vegetarian meals into the home eats. No, I have no plans to give up burgers, soft-shell crabs or deep-fried turkey. This is a guilt-lessening strategy. Complicating matters is The Hub. His dairy allergy means that I can’t add cheese as a protein option, and he dislikes most beans. That leaves eggs and tofu. The cause was helped considerably when I discovered packages of super-firm tofu already cut up into cubes – just drain and toss in. For stir-frys, I have marinated the cubes in a combination of soy sauce, lemon juice and garlic. This time, I added them right out of the package to a vegetable curry. Making curry easy and quick depends on finding good spice blends which add flavor without a lot of work. I used a blend called Vietnamese Sweet Lemon Curry that I got at Savory Spice Shop. It contains sugar, lemongrass, coriander and other spices. Heat the oil in a large saucepan and cook the onion until it’s golden. Add the garlic, ginger and aleppo pepper, cook briefly. Add the vegetables, tomatoes, tofu, coconut milk and 1 can of water or a bit more to make a not-too-thick consistency. Stir in the curry, turmeric and salt. Partially cover and simmer 20-30 minutes or until the vegetables are tender. Serve over rice. Demand for North Carolina seafood is growing as the local-foods movement has stretched from farms to other foods. The issues that come along with that increased interest are explored in “North Carolina’s Local Catch” on UNC-TV tonight at 10 p.m. The program explores seafood caught on the coast, the challenges facing those who harvest it and the place of fishing in the state’s coastal heritage. Chefs from Lone Cedar Cafe in Nags Head and Sammy’s Seafood House and Oyster Bar in Morehead City, along with people from coastal seafood markets, talk about using local seafood – and how to tell that it’s local in the first place. I once owned a wok. It was the early ’80s. Strangely, it was one of the first things I actually bought for my post-college kitchen. It joined dented aluminum pots and dull knives that I “borrowed” from my mother. Based on my cooking knowledge at the time, me having a wok made as much sense as using a Lamborghini as a church van. In college, my friends and I had discovered Asian food and vegetarian eating. Not that we were going to give up our burgers or frozen waffles, but it became “the thing” to have a wok. So, there it was in my kitchen, with a round bottom, a metal ring to sit it over my lame rented electric range, and no directions. Seasoning? Nobody told me about that. The ring made the wok hover so high over my limping burner that it barely got hot. Food stuck to it like wallpaper. Then, it started to rust. I believe I converted it to a planter in the back yard. Since then, I’ve done any Asian-style stir-frying in either a saute pan on the stove or (don’t throw things at me, now) an electric frying pan. I’m still working with electricity, although my range cranks out the heat now. (There’s no gas line to my house, and it would cost a stupid amount of money to get one.) My results haven’t been like the real stuff, but I was content. Until today. The story in today’s Raleigh News & Observer here made me long for that crack and sizzle of properly stir-fried food. The article made it sound easy, with simple instructions. Most of all, the article made it sound like I could, indeed, wrestle that wok (a flat-bottomed one) to the ground and make it do what I want. I bought a wok this morning, before I could weaken. And I signed up for WokWednesdays, a locally spurred plan for a group to cook its way through Grace Young’s “Stir-Frying to the Sky’s Edge.” Find out about it here. I can’t wok away now. Potato salad, ham and deviled eggs are the holy trinity of Easter Sunday dinners. A friend who wanted to be sure she had plenty of potato salad for an Easter brunch once made 10 pounds of it. Even with a lot of big-eating guests, that mound of tater salad melted slower than a slush pile in January. She ended up carrying the bowl from table to table, pushing the salad. It was grilled chicken rather than ham on my menu, but potato salad works with that, too. 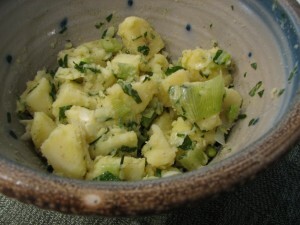 Although I did write an entire cookbook on potato salad, I came up with a rogue recipe using what I happened to have in the house. Cooked green peas would be good to use instead of the edamame, but I had edamame in the freezer – and The Hub is anti-pea. Put the potatoes in a large pot and cover with water, bring to a boil, and simmer for about 20 minutes, or until a knife passes easily into a potato with a bit of resistance. You may need to use tongs to remove the potatoes as they cook, if they’re different sizes. Drain and let cool until you can handle them, then peel and cut into pieces. Put the potatoes in a large bowl. In a small bowl, whisk together the olive oil, vinegar, lemon juice, lemon pepper and salt until combined. Add the remaining ingredients to the potatoes and toss gently to combine, then pour on the dressing and toss to coat all the pieces. Refrigerate several hours or overnight before serving. You know that growing your own food at home has reached trend status when Williams-Sonoma begins offering designer garden tools (personalized! ), seeds and raised-bed kits. The product line, romantically called Agrarian, also includes cheesemaking kits. If your chickens have been complaining about the poor feng shui of their abode, you can now order a new coop from this home of copper pots and ultra-mod toasters. The coop, with a cedar-shake roof and linoleum floor, is $879, plus shipping. Choose from red or green, depending on which will best coordinate with your flock. Some children are probably pretty confused this time of year, thinking that colored eggs are laid by a large rabbit. Gather round, kiddies, and I’ll tell you the truth: The colored eggs aren’t produced by the Easter Bunny, but by Big Bird. As the author of an entire book on deviled eggs, I do get questions. People vehemently opposed to waste ask what to do with all those eggs after the kids have hunted them down. Here’s what to do: Toss them in the trash. Unless you want to be known as the Easter host who gave everyone food poisoning. Cook some extra eggs and refrigerate them in anticipation of creamy, lovely deviled eggs. Offer the group something a little different this year with this recipe from my book “Deviled Eggs: 50 Recipes from Simple to Sassy” (Harvard Common Press, 2004). Combine the thoroughly mashed yolks with the sour cream, cream cheese and mustard. Stir in the smoked salmon and onion. Taste, then season with salt and pepper. Fill the whites evenly with the mixture and garnish each egg half with 3 or 4 capers. Makes 12. The two photos with my column in The News & Observer on Sunday didn’t do justice to the eight altars I saw in New Orleans. Visit here to see more, including the altar at the Lost Love Lounge – the disco ball is a nice touch. I had a busy weekend (it’s deviled egg season, you know) and the slow-cooker looked like a mighty good option on Sunday. The Hub and I were in the mood for beef, and a nice brisket called out to me. I adapted a recipe from “Fresh Every Day” by Sara Foster (Clarkson Potter, 2005) to make it something I could leave behind in the cooker and go on to greet deviled-egg fans. Also, I can’t get enough chipotle in my life. In a small bowl make the rub by combining the first 7 ingredients. Put it all on the brisket and rub it in. Stir the brown sugar, Worcestershire and balsamic vinegar together and pour over the brisket, turn to coat both sides, cover and refrigerate overnight. Put the remaining ingredients, starting with the tomatoes, in a saucepan, bring to a boil, reduce the heat and simmer for about 20 minutes or until reduced by a third. Cover and refrigerate. 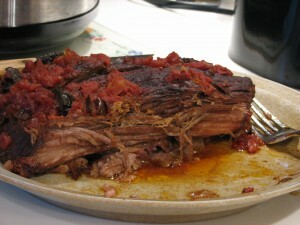 The next day, put the brisket in your slow cooker. Pour the sauce over. Cover and cook on Low heat for 5 to 6 hours or until done.